Home/Questions & Answers, The Cross/Why Salvation by Blood? Have you ever noticed how often the word blood is found in the Bible? In the Old Testament there’s blood everywhere: in basins, on doorposts, sprinkled in the tabernacle (Leviticus 4:6), and around the tabernacle (later the temple). There’s blood sprinkled on the people (Exodus 24:6, 8), blood flowing in the streets (1 Kings 8:5), blood dripping from the altar, and blood smeared on the ears of the priests and on their thumbs and big toes (Exodus 29:20). In the New Testament the references to blood continue with the same prolificacy but focus exclusively on the blood of one Man—Jesus Christ. From the blood of the Old Testament in the many and varied types, we are directed to the one and exclusive sacrifice of Jesus to whom all of the ceremonial blood in the Old Testament pointed. For this reason, His blood is called “the blood of the everlasting covenant” (Hebrews 13:20). It is this blood—the blood of the God-Man, and therefore called the blood of God (Acts 20:28)—the cross is the “crux,” the central message of Christianity. The blood of Christ is mentioned nearly three times as often as the cross of Christ and five times more frequently than the death of Christ. The word blood is the most common way of referring to the death of Christ. Why is this? What is so important about blood? Is there something inherently magical or mystical about Jesus’ blood that takes away sin? Is there a magical cleansing power in the literal blood of Jesus that removes sin, like bleach removes stains or like dish soap removes grease, to use the language of some? It is true that there are other methods of death that do not require blood shedding. Why could Jesus not have died by strangulation or by starvation? Why is it necessary that the death of Jesus should be so characterized by blood? There are serious implications to these quirky theological innovations, and out of this there has arisen an undue and unhelpful emphasis of the literalness of the blood. Of course the blood of Jesus was literal; to deny that it was literal is to deny the literalness of His body, His incarnation, and His person. But we should be careful not to isolate the blood of Jesus from other parts of His literal body. This is a danger that the Roman Catholic Church has fallen into when it speaks of the “Sacred Heart of Jesus” and observes a feast, established in 1765, in honor of it. In 1849 the Feast of the Precious Blood was established to commemorate the blood. In 1960 Pope John XXIII issued an Apostolic Letter “promoting devotion to the precious blood.” The problem with these innovations is that they isolate, venerate, and exalt a particular part of the body of Jesus and blur the biblical understanding of His sacrifice. The emphasis of the Bible is not on the literalness of the blood, but on the sacrifice of the blood—it was a literal sacrifice. Are we to think of the literal blood of Jesus as more precious than his literal body or his literal sacrifice? Is the emphasis of the Bible on the blood that was shed, or on the shedding of the blood? Death is a necessary punishment for sin. “The wages of sin is death” (Romans 6:23), a principle echoed through all of Scripture (Genesis 2:17; Ezekiel 18:4). Sin is so serious that it demands the most serious punishment; it forfeits the life. God answers sin by crushing the sinner, as He said He would crush the head of Satan! But why death by blood-shedding? Because blood is a symbol of life, Moses instructed the Israelites to give proper reverence for blood (Leviticus 17:11: “The life of the flesh is in the blood”). In the daily routine the Israelite was required to treat blood with the utmost respect because it represents life. The hunter who killed an animal had to drain the blood from the animal because the people must not eat blood. Then out of respect to the life taken the hunter was to cover the blood on the ground with dust. Second, shed blood is a sign of life lost. Shed blood is the surest and most definitive form of death—“the life of the flesh is in the blood.” On the cross Jesus died for sin by giving His blood, or His life. In John 2:19–22 Jesus speaks of the destruction of “the temple” which would be raised again the third day. He was speaking of His body which must be destroyed in death—by the separation of His “flesh and blood.” This is an important phrase—“flesh and blood”—used often in Scripture to denote the living human body (1 Corinthians 15:50; Matthew 16:17; Galatians 1:16; Ephesians 6:12). The same phrase is used of the body of Jesus, a living human body made in the likeness of a frail humanity (1 Corinthians 15:50; cf. Hebrews 5:7; Hebrews 2:14). The destruction of His body must be by the separation of His flesh from His blood. This shows that the life has been given for the sinner. It is this separation of the flesh and blood that we commemorate in the Lord’s Supper with the two distinct elements, the “bread” (flesh) and the “cup” (blood) (1 Corinthians 10:16; 11:24–25). Third, shed blood is a statement of the life-substituted. It is blood shed that is an atonement for sin, not the blood itself (i.e., in the body). “I have given it to you upon the altar” (emphasis added, Leviticus 17:11). It is not the blood of a simple cut, but the life-blood as a substitute for the life of the individual who offers it. 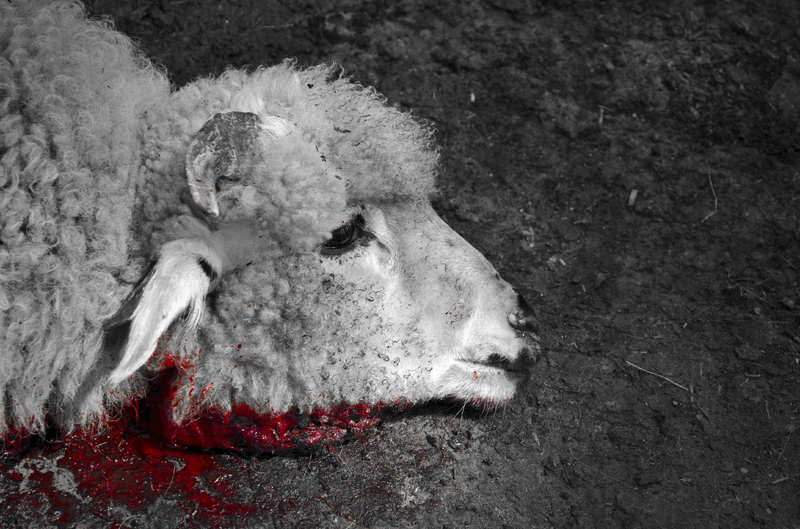 The Israelite brought the sacrificial animal, laid his hand on its head and killed it (e.g., Leviticus 4:27–29). By laying his hand on the head of the animal the worshipper identified himself with it and acknowledged that the animal was dying in his place or as his substitute. The blood sprinkled symbolized that the death was actually accomplished, the satisfaction was indeed made, and that substitution had been applied to the individual. The blood “sprinkled” is the blood applied. Christ’s death by blood-shedding, then, is a substitute for the death of the sinner. The sacrifice of Jesus was God’s sacrifice for the sinner (Isaiah 53:12). He died that the sinner might live. I could not understand sir.